Megan Grudzinski at the 2017 Warrior Games. loped by on running blades; another competitor wheeled past in her racing chair. Megan Palko Grudzinski stretched in advance of her first track event, showing no visible sign of her war injuries. An Army Reserve staff sergeant who served a year in Afghanistan, she returned to her Cleveland-area home with post-traumatic stress disorder (PTSD). At the U.S. Department of Defense Warrior Games in Chicago, the specifics were irrelevant. "No one asks what your injury is here," said Grudzinski, 35, a graduate student at Case Western Reserve Frances Payne Bolton School of Nursing who was competing for the second time in two years. She loves the feeling of belonging and the camaraderie that extends beyond the weeklong event. "There's rivalry, but we're friends," said Grudzinski, who medically retired from the U.S. Army in 2013. "You're part of the team." On a hot afternoon in July, Grudzinski took her stance for the 800-meter event, racing against others who also had minimal or no physical impairments. She took a quick lead and never lost it. With family members cheering from the stands, she won gold. Then she displayed a gold heart. When the second-place finisher felt sick from the heat, Grudzinski helped her walk to the podium for the medal ceremony. "She so wanted to get her medal," Grudzinski said. Grudzinski had always liked running, but turned it into a 3-mile-a-day habit in Afghanistan—often wearing her bulletproof vest for extra weight—to stay in shape and cope with stress. 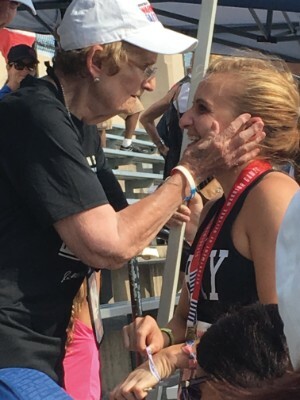 Megan Grudzinski's grandmother, Arlene Palko, congratulates her for winning gold at the 2017 Warrior Games. "You go to sleep to gunfire every night," said Grudzinski, who was a chemical specialist and hazardous materials technician assigned to Kandahar Airfield and a smaller base. "You have that fight-or-flight feeling all the time." She had volunteered to go to Afghanistan. "I wasn't married; I didn't have children," she said. "I would rather that I go instead of someone that had a family." At Kandahar Airfield, she volunteered to help out in the trauma bay. It was there she decided to become a nurse and, later opted for Case Western Reserve, her mother's alma mater. Back home, Grudzinski kept running, often competing in 5Ks along with her mother, Deborah Palko (NUR '85), a family nurse practitioner who runs an alcohol and drug detoxification program for veterans at the Louis Stokes Cleveland VA Medical Center. But Grudzinski struggled with sleeplessness, nightmares and depression. "I got to the point where I had to ask for help because I was in a very dark place." Part of that help has come from a service dog named Harley who wakes her up from nightmares and wards off panic attacks by signaling if someone is approaching from behind. Harley also attends classes with Grudzinski, who is working on two master's degrees to become a registered nurse and a nurse practitioner. "It took me a long time to get to a place where I am now," Grudzinski said. "And I have bad days. But part of the reason I try to share this is to try to let people know that [PTSD] doesn't make you a bad person or a weak person." *Times broke Warrior Games records and earned Grudzinski gold medals. Swimmer Andrew Henning (CWR '17), an All-American in the 800-yard freestyle relay, was selected as a recipient of a prestigious NCAA Postgraduate Scholarship. 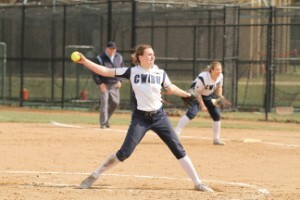 Annie Wennerberg (CWR '17) ended her career as a Spartan as the so ball team's all-time leading hitter with 33 home runs and its top pitcher with 53 wins. 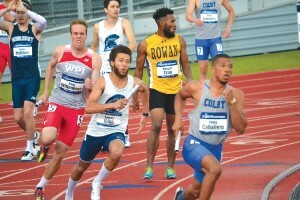 The men's 4x400-meter relay team qualified for the 2017 NCAA Division III Outdoor Track & Field Championships after setting a school-record time of 3:13.62 in the event earlier in the season.